STC: I have always loved reading and movies - actually, that doesn't quite describe it - I've always been addicted to reading and movies, most likely I think because of the alternate reality they offer; it's always appealed to me. I love working with text - it's been my job within education for the last 20+ years and I have long felt the pull to write. STC: That love of books and movies - stories essentially, I guess. Ever since I was little, that pull into the world of a story has been very intense for me. It seemed a natural evolution to be the one telling the story. STC: Three huge influences for me growing up were the movies Planet of the Apes, The Omega Man and Mad Max 2. 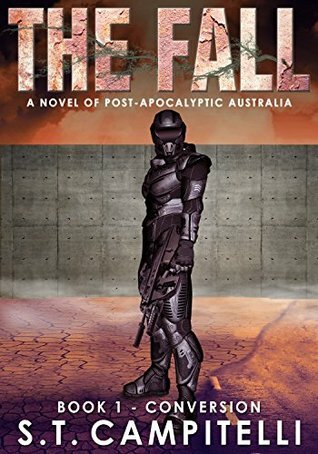 The post-apocalyptic landscapes and stories in all three I found absolutely compelling; I'm not sure why, but there's this irresistible lure for me around the state of the world after it's gone to pot. What does it look like? What do we become? These stories really influenced what The Fall is. STC: Well, technically, it's science-fiction, and I don't have a problem with that, but more accurately, I term it post-apocalyptic. I guess it's a sub-genre. STC: It's that pull of the post-apocalyptic landscape - it's almost alien. That 'alien-ness' is one of the reasons I started the book the way I did - the implication that this whole thing may have been started from elsewhere. The bleakness of these type of stories is compelling when handled well, like The Road, and I think that's another thing - how do we cope in such a bleak, seemingly hopeless environment? STC: They came to me as separate things. There's a real technology aspect to the book which I have always been interested in - what will close-future tech look like? And the other aspect was the compound Kulin Wallcom) and being surrounded by danger. So, I brought these two ideas together in a close-future post-apoc setting. The main character is an academic - I have worked in university settings for 20+ years, so it was a familiar fit, and though the main character isn't 'me' as such, it's right that there's a little bit of the author in every character. STC: There's no one single protagonist in The Fall. I deliberately went for a multi-pronged approach, taking a leaf out of Game of Thrones; I really like how George Martin shows us a range of people on a sliding continuum of 'good' to 'bad' who shuffle along that continuum - he does that expertly. I'm trying the same thing with my protagonists; if I can get a tenth as good as GoT, I'll be happy. In terms of inspirations for them - no one especially, but I was after a strong, dependable but not-perfect main in John - he has doubts, he's not a natural killer, he questions. He will evolve as the books progress. STC: There are a few but the two mains are Headhunter and the Alpha Kronenburg. I wanted a somewhat likeable psycho in the Headhunter - I mean, you don't like him, but the man has as nice turn of phrase! So I guess I was inspired by that typical cinematic British educated 'nut' - a bit Clockwork Orange. There's also the Alpha Kronenburg - I think a possible gap in this genre is that the 'infected' beings or zombies (though these aren't zombies) never really have a perspective and I wanted to give them that. They get it through Kronenburg. I have plans for him and he will play a big part in the story going forward, not always how you might think either. STC: No single part really, but it was the order of things. Sometimes, I felt the sequencing wasn't quite right and I had to have a bit of back and forth on that. I initially wrote the ending in an entirely different way, so that also took a bit of going back to the keyboard. STC: Mmmm ... choosing among your children! I think the scene where Skylar, Riko and Harley find the infected daughter of the suicide. It actually touched me writing that and I have had reader feedback that that is a very emotive scene. The final attack on the wallcom was fun to write. STC: Part time (for now!). I am involved in tertiary education. STC: Phillip Reeves Mortal Engines series - love it! Don't know why/how I haven't come across this before. It is absolutely riveting. STC: Read a lot, widely, and write, then get feedback. Give your writing to people to read before publishing. Listen carefully - some advice is excellent, some not - you be the judge. But write - take the chance! Also, don't be afraid to re-write, don't get stuck into one way of thinking about a character, scene or situation.